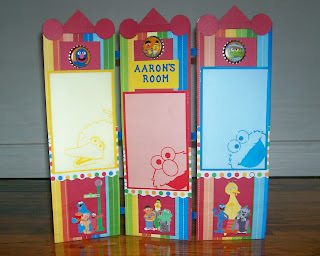 Confessions of a 20-something Scrapbooking Mother: Project for Aaron's bedroom! My 11-year-old daughter is a HUGE Elmo fan . . . she got a Tickle Me Elmo for her 1st Christmas when they were HUGELY popular! We love the Elmo on the screen! This is totally cute! How big is it? You did an amazing job! Thanks for stopping by my blog and leaving a comment. Stop by anytime. I'll be back to see what you're up to! Very cute! I think I love the bottle cap elements the most.